It is a little ironic then that one of my worries I developed over the years came from a habit of hers. Besides the soap opera she would always record, my mom religiously watched the Weather Channel growing up. Often she would come downstairs where I would be watching our only cable TV and ask if she could quickly check the weather. I knew the drill. It was time for “Local on the 8s.” I would change the channel and listen to the calming music as my mom watched the report. After the automated voice would come on and read the outlook, my mom would let me change it. I grew up watching the Weather Channel a lot. Because of snowy Spokane weather and the impact it would have on daily life, it was important to keep a close eye on the Weather Channel. However, my mom was definitely a year-round viewer, interested in each and every forecast. Her dependence on the Weather Channel rubbed off on me. Through the time I entered high school and into my adult years, I started to become pretty obsessed with the weather report. I wanted to know what I could expect for my various sporting events, both when I participated in them and then when I worked them. Pretty soon my interest in knowing the weather grew beyond just wanting the forecast for games. I now wanted to know exactly what the weather would be for weekends, vacations, family coming to town, festivals, etc. As my reliance on weather reports grew, so did technology. The Weather Channel went from the television to the internet to smart phone apps. Along with the greater accessibility also came more thorough updates. Weekend reports turned to 5-day reports. Those 5-day reports turned to 10-day reports. Believe it or not, you can now get 25-day reports. These extended reports proved to be the death of me. I would look at the forecast for a date on the calendar a whole week and a half out and start to stress. 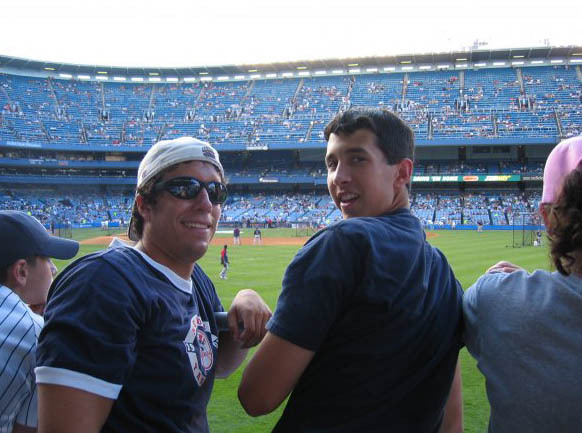 I remember when my dad, brother, and I went to New York several years ago to watch baseball at Yankee Stadium and Shea Stadium during the last season for both parks. In early July I looked at the forecast for mid-July and saw a 60% chance of rain. I let it make me miserable because my biggest fear was that the games would be rained out and our once-in-a-lifetime opportunity would be ruined. It turned out to be beautiful. 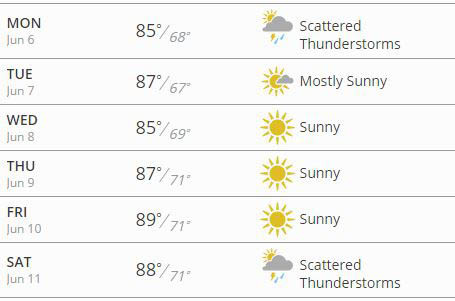 For our New York trip, I ended up worrying about the weather way too early in the game. Of course I bring this topic up because our wedding week forecast is now in full view. It goes without saying that I want the weather to be gorgeous for all the events leading up to the wedding and for the big day itself. However, I am trying not to get too caught up in the extended forecast because it just isn’t worth it. It has taken me long enough to finally realize that a 10-day outlook is a crapshoot. With that said, deep down inside I am encouraged that the weather man is showing a very pleasant several days in store for us next week. However, I am waiting until the end of this week to really take stock in it. This means absolutely nothing but our wedding week is looking pretty good! The weather itself already has enough control over us. I suppose we shouldn’t succumb to it anymore by worrying about what it might or might do over a week in advance. To be honest, I will continue to take peeks at the weather over the next couple days. However, I won’t let it bother me one way or the other. Besides, wedding weeks are impossible to mess up, right? Don’t Blink.